Who Will Advance From The CONCACAF Women’s World Cup Qualifiers? United States’ Abby Wambach celebrates her goal against Trinidad and Tobago during the second half of a CONCACAF Women’s Championship match on Wednesday in Kansas City, Kansas. The opening matches of the 2014 CONCACAF Championship were played on Wednesday, marking the start of the nine-month countdown to next summer’s Women’s World Cup. Although the focus Wednesday night was on the United States (six-time CONCACAF champions and the tournament’s host), the spotlight quickly shifted to the U.S. women’s opponent, Trinidad and Tobago. The Trinidadians managed to hold the Americans scoreless until the 55th minute, when Abby Wambach headed in her 171st international goal (the all-time record for any American player, male or female). The U.S. won 1-0. Up to five teams from the North American, Central American and Caribbean football associations might appear at next year’s World Cup. Only three CONCACAF teams played in the 2011 tournament (the U.S., Canada and Mexico). As next year’s host, Canada receives an automatic bid, which in turn allows for an “extra” CONCACAF spot. The top three teams from the CONCACAF Championship will automatically qualify. The fourth-place team will play in a two-game series against Ecuador, who placed third in the 2014 Copa América Femenina, to determine who goes to the World Cup. All of this to say that an otherwise unlikely CONCACAF team, like Trinidad and Tobago, could make its World Cup debut in 2015. But just how likely are the Soca Princesses to be one of the top four CONCACAF tournament teams? To calculate the expected wins and various probabilities for each team in the tournament, we used the FIFA Women’s World Rankings, which are based on a variant of our old friend the Elo ratings. FIFA provides a nice explanation of how to turn their ratings into win probabilities for a given matchup (though for group stage matches we had to adjust the formula a bit to account for the possibility of draws). Once we had the ratings and probabilities, we programmed a Monte Carlo simulation to run 1,000 simulations and track how well each team performed in the group stage, as well as how far it advanced in the knockout round. Despite last night’s disorganized formation and lack of finishing from the U.S. side, the Americans are still far and away the CONCACAF favorites, with a 95.5 percent chance of winning the tournament. 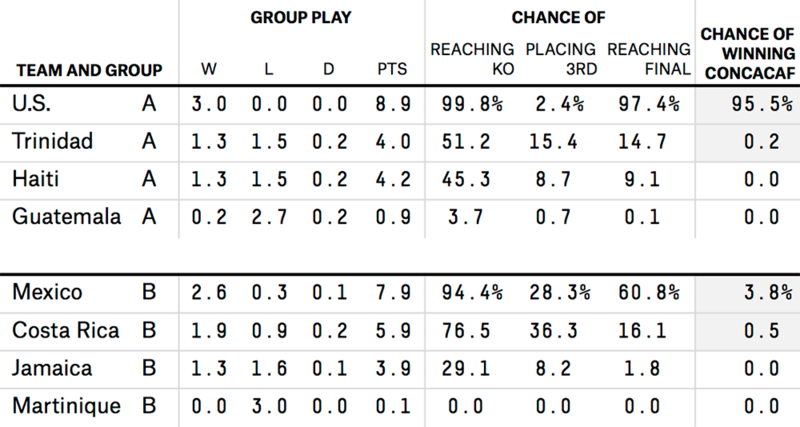 Mexico is the next most likely team to win, but it has only a 3.8 percent chance. Trinidad and Tobago, on the other hand, has a less than 1 percent chance of winning. Fortunately for Trinidad and Tobago, reaching the knockout round of the tournament is enough to give the team a shot at going to the World Cup, and it has a 51.2 percent chance of doing just that. Wednesday night’s quality performance, including 11 saves by Trinidadian goalkeeper Kimika Forbes, may bode well. Haiti sits just behind Trinidad in Group A, with a 45.3 percent chance of reaching the knockout round. Haiti also edged past Guatemala last night 1-0, despite going down a player in the 17th minute after goalkeeper Cynthia Chery was issued a straight red card. The Group B matches start Thursday night, with Costa Rica taking on top-seeded Mexico, and Jamaica playing Martinique (Martinique can’t qualify for the World Cup because it is not a member of FIFA, so we threw out the two simulations we ran where Martinique advanced). Mexico is the most likely team to advance from Group B, with a 94.4 percent chance, but Costa Rican standout Shirley Cruz Traña (who plays for the French club Paris Saint-Germain in one of the top women’s leagues) will likely be a major threat in Thursday’s game. The next Group A matches take place Friday, when the U.S. will resume play against Haiti. After Wednesday night’s performance, newly appointed head coach Jill Ellis may be looking to tweak a rather chaotic formation. The U.S. players veered from their typical 4-4-2 formation against the Trinidadians; Wambach sat in an attacking midfield spot but she often drifted forward, creating what looked almost like a 4-1-3-2 at times. Similarly, Trinidad will need to break from Wednesday night’s defensive 4-5-1 formation to put some points up against Guatemala. We’ll be updating our predictions periodically throughout the CONCACAF tournament. CORRECTION (Oct. 24, 4:37 p.m.): A previous version of this post included a table with an incorrect column header. The table lists the chances of placing third, not reaching the third-place game.